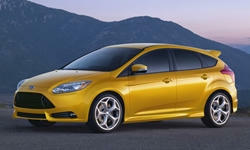 2013 Ford Focus Pros and Cons: Why (Not) This Car? Nothing suits my daily driving better than a compact hatchback or wagon. There's enough space inside for my five-person family and our weekly CostCo haul, along with more agile handling and better mpg than is possible with a larger, heavier vehicle. A compact hatch turned up to 11, the MazdaSpeed3 has long ranked highly on my wishlist. For 2013, Ford has given a similar treatment to its compact hatch. Does the new Focus ST match the MS3's strengths while avoiding its shortfalls? The ST2 Package includes color accents on partial leather Recaro seats. Why the 2013 Ford Focus? My top priority is how a car steers and handles. It seems this was also the top priority for the engineers who developed the Focus ST. For this class of car, balance, composure, and grip are all outstanding. Torque vectoring via select application of the brakes (in a not quite transparent manner) nearly eliminates understeer. Lift the throttle heading hard into a turn, and the rear end rotates just enough to help the car around. Optional Recaro seats hold you firmly in place so you can focus on driving. A unique variable ratio steering rack provides quick responses together with a firm on-center feel. This said, the Focus doesn't feel quite as eager or as hard-edged as the MazdaSpeed3, much less a Mitsubishi Evo. Such is the cost of its much higher level of refinement. Also, under hard acceleration the steering wheel tugs mildly back and forth. There's not nearly enough torque steer to cause problems or kill the thrill, but it's there. The 2012 Focus blew me away by offering the quietness, smoothness, and rock-solid build typical of a $50,000 German car at less than half the price. None of this has been lost in the transformation to the high-performance ST. At 85, the car sounds and feels like it's barely moving. A "sound symposer" amplifies the sound of the engine when revved. Even with it the engine is far quieter than in other hot hatches. A few times I wondered why the car suddenly lacked energy, only to then notice that the tach needle was pegged against the 6,800 rpm redline. The ride is firm and occasionally a little fidgety, but easily livable. Even better from this angle. MyFord Touch infotainment interface is part of the ST2 Package. Nav adds another $795. The sticker price on a regular Focus can exceed $27,000. So how could Ford possibly add a turbocharged engine, sport suspension, and Recaro seats without pricing the car out of reach? Well, they have. The ST's unique features add about $2,100 to the price of the car. The base price is $24,495. For the Recaros in partial leather, Sony premium audio, and the MyFord Touch interface, add the $2,385 ST2 Package. (I personally prefer the more colorful partial leather seat trim of this package to the solid charcoal full leather trim of the $4,435 ST3 Package.) Nav adds another $795, a sunroof another $895. A MazdaSpeed3 is about $1,100 less, but also looks and feels like a far less expensive car. A Volkswagen GTI costs about the same, but doesn't perform or handle nearly as well. Yes, the most impressive aspect of the Focus ST's engine is its fuel economy. A Mitsubishi Evo is rated 17 mpg city, 23 mpg highway by the EPA. A MazdaSpeed3, 18/25. The Ford Focus ST easily exceeds them both, with guilt-free EPA ratings of 23/32. Not that the engine's performance isn't also impressive. With 252 horsepower and 270 foot-pounds of torque, the limiting factor at low speeds is the ability of the front tires to transfer this power and torque to the pavement. At higher speeds it's quick, but not blazingly so. At 3,300 pounds, the Focus ST is too heavy for that. The car's quietness and refinement aren't entirely without a downside. The turbo's boost comes on as a smooth surge, not with a punch to the lower back. Consequently, the Focus ST doesn't feel as quick as it is. My main issue with the MazdaSpeed3 has been its styling, both inside and out. The Focus ST is far more attractive, taking the already stylish Focus hatchback and adding a tastefully done black grille, body kit, and 18-inch alloy wheels. Inside, the Ford looks and feels much more expensive, while again being much more attractive. Why Not the 2013 Ford Focus? If I could change one thing about the Focus ST, it would be the view forward from the driver seat. The instrument panel is tall and very deep. A lower, shallower instrument panel beneath a less steeply raked windshield would enable a more direct, more intimate connection between the driver, the car, and the road. This said, the view forward is passable. It isn't the deal killer it is in some other cars. Like other recently designed Fords, the Focus has a tighter rear seat than most competitors. At 5-9, I can sit behind myself with perhaps an inch to spare. Larger, simpler black grille a classy way to express the car's performance. One of the car's weaknesses. With its large instrument panel and intrusive center stack and center console, some people find the Focus's front seat sportily cockpit-like, but others find it cramped. That I had to double up on many of the reasons to buy the Focus ST but could come up with only three reasons not to buy it (none of which would come close to dissuading me) might tell you all you need to know. Though it doesn't provide as visceral a driving experience as an Evo or a MazdaSpeed3, the Focus ST is still very fun to drive, while also being far more refined than those cars. It looks and feels expensive while doing just about everything very well, all for a price in the twenties. Plenty of power and torque. Much handier than a sedan. Preview drive. Ford provided insured and fueled cars along with lunch. 2013 Ford Focus pros and cons, according to Michael Karesh: the best reasons for buying (or not buying) the 2013 Ford Focus. Join TrueDelta to post your own impressions.